On January 8, 1942, Stephen Hawking was born to Frank and Isobel Hawking in Oxford, England. Frank was a researcher specializing in tropical diseases. He later became the Head of the Division of Parasitology at The National Institute of Medical Research. it was at this research center that the two met and got together for a meaningful future. She had got in to odd jobs before she ended up as a secretary at the institute. At school, Stephen did not cut an impressive figure. Awkward and skinny Stephen spoke with a lisp called Hawkingese by his classmates. He had few friends, and highbrow tastes. He preferred classical music to Jazz, Rock’ n Roll and Pop. Bertrand Russell was his hero, and he loved to read Kingsley Amis, Aldous Huxley and William Golding. His favorite pastime was to cycle around the countryside, along with his friends, and to create complex board games. One such game that he invented Dynasty, had a set of complicated rules and took days to finish one game. It was perhaps Stephen’s desire to play God, the feeling of having created the world and the laws that govern it, which comes through right from childhood. But his brilliance was evident even then. After dabbling in aeromodelling, mysticism and the occult, Stephen’s interest finally turned to physics and mathematics. His father objected to his appearing for his A-Level examination with these subjects. He wanted Stephen to study medicine, as it was the subject of his vocation. Another reason for the opposition was the absence of Mathematics Fellow at the University College, Oxford, where Frank had studied earlier and wanted Stephen to go. As a compromise, chemistry was selected along with mathematics and physics. During the final years of school, Stephen and his friends developed and built a computer – LUCE – the Logical Uniselector Computing Engine. Stephen went to Cambridge University to begin his doctorate in general relativity and cosmology. He hoped to do his research under Fred Hoyle, but was assigned to a tutor; a theorist named Dennis Sciama instead. He was aware of the abilities as well as the physical sufferings that Stephen was undergoing at that time. It all started during his final days at Oxford. Stephen noticed that he was becoming ‘clumsy’. He bumped into things, fell for no apparent reason and his speech was at times slurred. He was never well coordinated as a child, and avoided sport or any physical activity. His handwriting was a cause for concern to his teachers. During Christmas of ’62, his parents noticed something queer in him, and in the beginning of 1963, Stephen had to spend two weeks at the hospital undergoing various tests. The prognosis was not good. He was diagnosed as having Amyotropic Lateral Sclerosis (ALA), also known as Motor Neuron Disease or Lou Gehrig’s Syndrome. An incurable disease, ALA affects the nerve cells and the body is slowly wasted away. The mind is not affected at all, and there is no physical pain, but the despair of seeing the body wasting away breaks the strongest will. He was not expected to live long enough to complete his doctorate and achieve his dream. A feeling of despair and depression was but natural. However, Stephen took matters in his own hands. Whenever he felt sorry for himself, he thought of a little boy he had met in the hospital who died of leukemia soon afterwards. Perhaps the main driving force behind his will to live was his meeting with and love for Jane Wilde. They were soon engaged and Stephen realized that he had to complete his Ph.D. before he could get a job and marry Jane. Things began to improve. He met Roger Penrose at King’s College in London. Penrose, a mathematician at Birkbeek College in London had developed the idea of space-time singularity in a black hole. Stephen decided to apply the singularity theory to the universe, and was awarded a Ph.D. on the strength of this one brilliant stroke of genius. Jane was still an undergraduate at Westfield College in London. She had to go to London every week. Hence, they had to find a place where Stephen could manage things on his own. After looking around for some time, living in temporary accommodations, they finally rented a house about a 100 yards from the college, which they ultimately bought. They lived there for some years, until Stephen found it difficult to walk up the stairs. The college then offered them a ground floor flat with large rooms and wide doors, close to the University department, also enabling Stephen to commute in his electric wheel chair. By now he was father of two children. Until 1974, Jane had managed to help Stephen and look after the house and bring up the children, without any outside help. But now it was getting a little difficult to do so. They decided to have one of the research students to come and live with them in return for free accommodation and special attention. Together, they helped Stephen in his daily routine as the disease was rearing its ugly head, paralyzing him completely. Five or six years later, they had to hire regular nurses, who came for an hour or two in the mornings and evenings. But after 1985, when Stephen caught pneumonia and had to have a tracheotomy operation, he needed 24 hours nursing care. All this was made possible only due to grants from several foundations in appreciation of his wealth of knowledge and as a tribute to his singular efforts in the field of Cosmic Research. Stephen was in Geneva when he caught pneumonia and had to be kept on life support systems. Doctors felt that he would not survive and they advised Jane to remove his life support systems, as it was not worth it. Jane did not allow them to do so. Stephen was flown back to Addenbrooke’s Hospital in Cambridge, where Roger Grey, a surgeon carried out the tracheotomy. He saved Stephen, but the operation took away his voice. Even before the operation, Stephen’s speech was slurred and few could decipher. He could communicate, dictate his scientific papers to his secretary and conduct seminars through an interpreter who would repeat Stephen’s words more clearly. But the operation changed all that. For quite some time, Stephen could communicate only by spelling a word – letter by letter raising his eyebrows when someone pointed to the correct letter. He faced difficulty communicating, and writing a scientific paper was out of question. When Walt Woltosz, a computer expert in California, heard about Stephen’s plight, he sent a computer program, Equalizer. This program allowed a person to select words from a series of menus on the screen, controlled by a switch, which could be operated either by hand or by eye movement. After the sentence or the paragraph is completed, it could be sent to a speech synthesizer for printing. Initially, Stephen ran this program on his desktop computer. Later, David Mason of Cambridge Adaptive Communication fitted a small portable computer and speech synthesizer to Stephen’s wheel chair, giving him a voice, with an American accent no doubt, but a voice, nonetheless. Communication became much easier as Stephen could either speak what he wanted to say, or save it on a disk for later use – to print or to recall sentence by sentence. This system has allowed him not only to write books and scientific papers, but also to take part in scientific and popular talks and seminars. His bestseller book A Brief History of Time was revised after he had found his electronic voice. Stephen Hawking has received and continues to receive many honors and awards. In 1974, he was elected Fellow of The Royal Society, one of the youngest to be honored. He received the CBE in 1982 and was made a Companion of Honor in 1989. Amongst the many international and foreign awards and prizes is the Membership of the National Academy of Sciences of the United States. His marriage ended after 25 years over his affair with Elaine Mason, one of his nurses and the wife of the man who designed his voice synthesizer. He has subsequently married her. Stephen Hawking remains active even today. 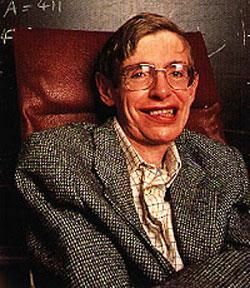 While most physicists naturally use paper and pencil for their calculations, Hawking has the capacity to do them in his mind. Kip Thorne, a professor of theoretical physics at Caltech recalls, “As Stephen gradually lost the use of his hands, he had to start developing geometrical arguments that he could do pictorially in his head. He developed a very powerful set of tools that nobody else really had…..” His memory, like his genius, is legendary. Dependent on prostheses – wheelchair, customized computer, voice synthesizer, Stephen has reached brilliant heights, not letting his handicap push him down the hill. Along with his research, he travels a lot to give public lectures. This entry was posted in Uncategorized and tagged Stephen Hawking. Bookmark the permalink. Stephen SIR is really a man honour… hats off to him..
i wish he healthy life to enrich the area of space.. Hats off to sir stephen hawking . i am very much impressed by his work ..
‘I am fan of sir stephen hawking. The great Scientist Mr Stephan hawking sir u are the greatest person in the world. Hats off to u.